Dixon Hall Lewis was born on 10 August 1802 in Dinwiddie County, Virginia. He married Susan Elizabeth Elmore, daughter of John Archer Elmore and Mary Ann Martin, on 11 March 1823 in Autauga County, Alabama, and Dixon's brother Hamlin married Susan's sister Mary. Dixon Hall Lewis died on 25 October 1848 at age 46 in New York County, New York. His wife Susan Elizabeth Elmore became a widow at his death. He was interred at Green-wood Cemetery, Brooklyn, Kings County, New York. A short biographical sketch of Dixon Hall Lewis appears in Alabama, Her History, Resources, War Record, and Public Men, from 1540 to 1872. For additional biographical information, see The Biographical Directory of the United States Congress. Dixon Hall Lewis lawyer, representative in congress, U. S. senator, was bom August 10, 1802, in Hancock County, Ga., and died in New York City, October 25, 1848; son of Francis and Mary Dixon (Hall) Lewis, the former a native of Dinwiddle County, Va., who moved with his parents to Hancock County, Ga., in his youth, and in 1818, moved with his family to Alabama and settled in Lowndes County; grandson of Francis Lewis who lived in Dinwiddle County, Va., and of Dixon and Anna (Hunt) Hall, who lived in Hancock County, Cki., and in Montgomery County, the former a soldier in the Revolution: great-grandson of John and Catherine (Croy) Lewis, of Belvoir, and of John and Anne (Bolling) Hall, the former a justice in colonial times, the latter a member of the Boiling and Randolph families. The Lewis family is of Welsh descent; the original emigrant, Robert Lewis, came with his wife ]6lizabeth from Graves End, England, in April, 1636. Mr. Lewis received his early education from Mount Zion academy, under the direction of Rev. Nathan S. S. Beeman, and was graduated from Columbia college. South Carolina, 1822. 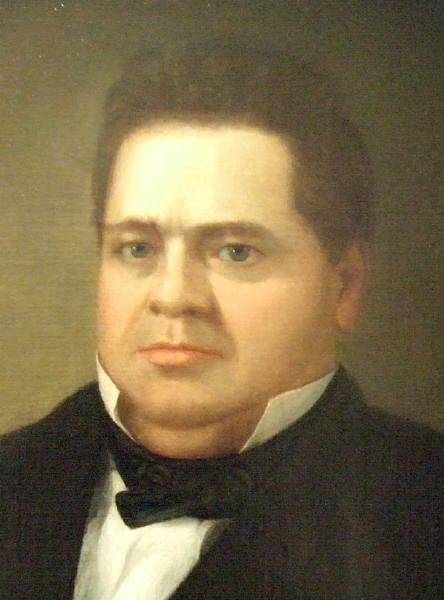 He read law in the office of Judge Hitchcock in Cahaba; was admitted to the bar in 1823; and opened a law office in Montgomery in 1825. The following year he was elected to the State legislature from Montgomery County, and was reelected in 1827 and 1828. He was a leading member in the counsels of the legislature, and in 1827 made a report in the house on the relation and policy of the State toward the Indian tribes within its territorial limits, which established for him a high position as a legislator and exerted an influence in the removal of the remaining tribes from the state. Mr. Lewis was elected a representative in congress in 1829 from southern Alabama, and was again elected in 1831, defeating Gov. Murphy of Monroe County. He was returned to congress in 1833, 1835, 1837, and 1839, with little opposition, and during the latter year, during the contest for speakership which lasted three months, was seven times balloted for as the nominee of his party for the position, but was defeated by the faction of his party controlled by Senator Benton. In 1841, he was elected to congress for the seventh time, that time on the general ticket with Hon. H. W. HiUiard of Montgomery as his opponent; and two years later defeated Hon. Henry C. Lee of Perry. He resigned in 1844, after a service of fifteen consecutive years in the house of representatives, in order to accept the appointment made by Gov. Fitzpatrick to the U.S. senate to fill the vacancy caused by the appointment of the Hon. William R. King to the court of France. His appointment was ratified the following December by the legislature. In 1847, Mr. Lewis was reelected to the Federal senate over Hon. William R. King, who had become a candidate for his former seat, and Judge A. F. Hopkins, and was serving in that body at the time of his death. During his service in the national house of representatives, he was chairman of the committee on ways and means, and in the senate was chairman of the financial committee. His politics were of the extreme state-rights school, and he advocated nullification and secession. He was a trustee of the University of Alabama, 1828-1831. His death occurred while on a visit to New York City, and the city authorities arranged a public funeral. Married: March 11, 1823, in Autauga County, to Susan Elizabeth, daughter of Gen. John Archer Elmore (q.v. ), a soldier in the Revolution, who moved to Laurens District, S. C, and served in the State legislature, married a Miss Martin, sister of Abram Martin of Montgomery, and moved to Autauga County In 1819, where he became a representative in the Alabama legislature; sister of BlrankElnaore, who succeeded John C. Calhoun intEeTr. S. senate after the latter's death, but survived him only a few months, of John Elmore, a distinguished lawyer at the Montgomery bar, of Rush Elmore, appointed chief Justice of the territory of Kansas by Franlclin Pierce, of Wiliam A. Elmore, superintendent of the New Orleans mint during President Buchanan's administration, and of Col. H. M. Elmore, who commanded a Texas regiment in the C. S. Army, during the War of Secession.. Her eldest sister married Benjamin Fitzpatrick, who was three times governor of Alabama, and was U. S. senator at the time of secession. Mrs. Lewis moved from Alabama to Texas in 1854, with her surviving children. Children: 1. Laura Ann, m. Robert Lindsey Scott; 2. Francis Maxcy, served in the C. S. Army, War of Secession, m. Carrie Balcer; 3. John Archer, b. 1829, d. 1850; 4. Mary Susan, b. 1830, d. 1850; 5. Dixon Hall, b. February 3, 1834, served as a captain in Emons regiment, C. S. Army, War of Secession, d. April, 1899, m. in 1860, to Sarah Hill, of West Texas; 6. William Henry, killed in the battle of the Wilderness, 1864; 7. Sarah Terry Fitzpatrick, b. 1838, d. 1839. Last residence: Washington, D. C. and Lowndes County. History of Alabama and Dictionary of Alabama Biography, by Thomas McAdory Owen. Chicago: S. J. Clarke Publishing Company, 1921.